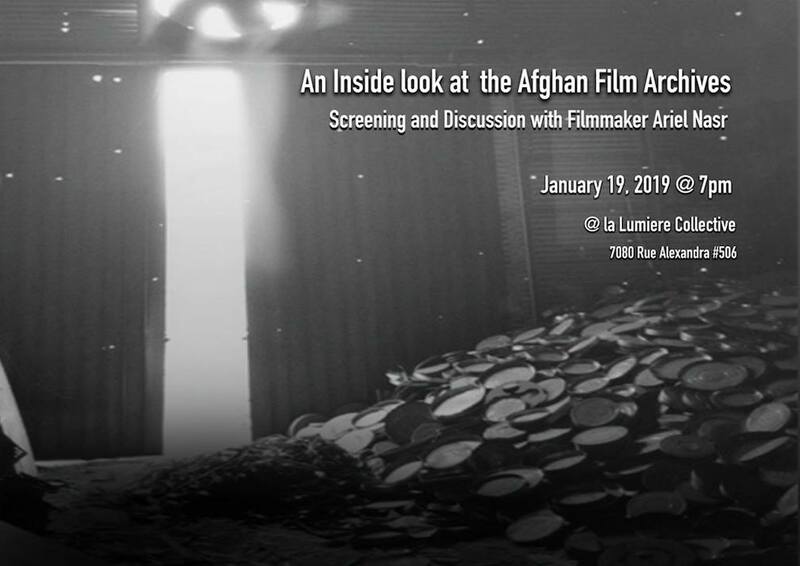 For nearly five years, filmmaker Ariel Nasr has had full access to the national film archive of Afghanistan while creating his soon to be released feature documentary, The Forbidden Reel. Co-produced by Montreal-based indie production company, Loaded Pictures and the National Film Board of Canada, with the participation of TVO, RDI, and Al Jazeera, Forbidden Reel explores Afghanistan’s political history through the lenses of its filmmakers. The film chronicles the resistance and resilience of Afghan artists, activists, and people amidst the waves of imperialist invasion, occupation, and destabilization that have characterized the nation’s modern history. Nasr will present selected excerpts from the film, and take us on a guided tour of the archive’s contents. Ariel Nasr is an award-winning documentary filmmaker whose work has earned an Oscar nomination, a Canadian Screen Award, and more than a dozen other awards from festivals around the world. Director of the National Film Board’s The Boxing Girls of Kabul, Good Morning Kandahar, and the interactive, Kabul Portraits, Ariel’s work encompasses writing, directing and producing across multiple formats and platforms and has been broadcast in Canada the US, across Latin America, Europe, East Asia and the Middle East. Based in Montreal, alongside Forbidden Reel Ariel is currently working on One Year Later, a CBC documentary about the 2017 Quebec Mosque Shooting. Based out of Concordia’s Global Emergent Media Lab, and operating in collaboration with Politics of Alternative Media, Cinema in the Midst of Struggle is a public screening series that aims to raise awareness of historical and contemporary anti-colonial, anti-racist, anti-imperialist, and anti-capitalist struggles. Our programming explores a wide spectrum of historical models of political filmmaking that have been produced in response to specific infrastructural and contextual dynamics. These case studies are separated by time and geopolitics, but each challenge the necessity of an idealized form of a pure activist film-work by exemplifying real projects that took on the resources of their circumstance to make a political intervention, or bring light to an urgent struggle. Understanding the relations between these films, the political struggles they participate in, and the alternative modes of production, distribution, and exhibition they represent, provides us with a unique opportunity to better understand the dynamics and necessity of internationalist solidarity in the global fight for economic and social justice.